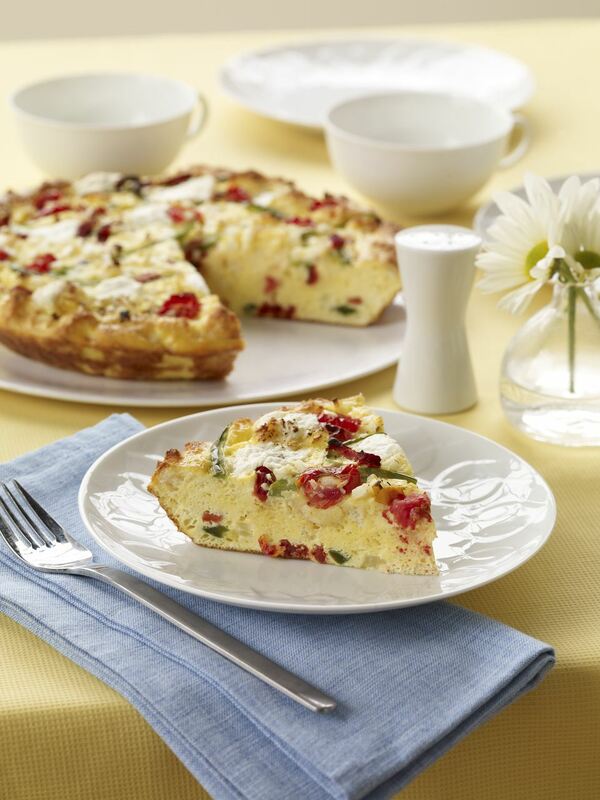 Frittatas are a great meal-in-one-dish, and this one does not disappoint. Since it is loaded with mushrooms, potatoes, asparagus, and tomatoes, you get a full complement of vegetables. Eggs, bacon, and Parmesan cheese provide the protein. Turkey bacon is used to cut the calories down, but you may substitute traditional bacon or even vegetarian bacon if you wish. One serving is only 220 calories, which leaves room for a side of fruit to satisfy that sweet tooth. It's great for breakfast, brunch, lunch or dinner and quick to make. Preheat oven to 400 F. Whisk together eggs, egg whites, Parmesan cheese, pepper, and basil; reserve in refrigerator until ready to use. Heat 1 tablespoon olive oil in a 10-inch cast-iron skillet or oven-safe pan over medium-high heat. Add onion and cook, stirring, until soft and slightly golden, 7 to 9 minutes. Add turkey bacon and cook, stirring, until crisp, 4 to 5 minutes. Add mushrooms and cook until softened, 3 to 4 minutes. Add potato, asparagus, and tomatoes; cook 2 more minutes until asparagus just begins to soften. Add remaining oil to skillet and stir to incorporate with bacon and vegetables. Add egg mixture and tilt pan to evenly distribute eggs. Cook until eggs just begin to set, 3 to 4 minutes. Transfer to oven and bake until top is lightly browned and eggs are fully set, 11 to 12 minutes.